Hong Kong-based food delivery startup Plum ceased its Singapore operations on 21 January, informing their customers via in-app notifications and emails just two days before, which sparked some grievance among users. We learnt that 110 of its full-time staff in its headquarters in Hong Kong, including co-founder Desmond Clinton Cheung, had terminated their contracts. Staff who chose to stay in the newly restructured company will be offered equity shares. Plum Singapore previously served the CBD area and Fusionopolis, and added new pick-up points in the Changi business hubs and at the Health Promotion Board (HPB), according to its Facebook. Shortly after we released the news, local hawker food delivery startup WhyQ reached out to us to inform us that they have “been working with Plum to merge” their customer and partner bases. Rishabh Singhvi, the co-founder of WhyQ, clarified in an email with us that this move is “more of a collaboration than an acquisition”. “[There were] no monetary transactions to acquire; however, we are giving them a token conversion-based referral fee for their customers,” he said. Plum is reaching out to their customers through EDMs (electronic direct mail) and push notifications to offer promotions and to encourage them to place their first hawker orders on WhyQ, according to Rishabh. 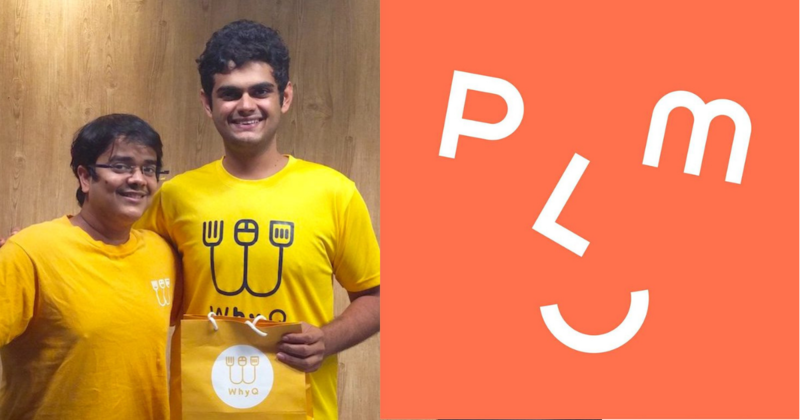 Rishabh noted that Plum’s customers are mainly office workers who use the service for lunch deliveries, so WhyQ is also running a campaign to inform these customers that they deliver “not only to their offices but also to their residences”. He revealed that it was Plum who initiated contact with WhyQ and the merger was done without any issues. “It was a great way for WhyQ to expand our customer base quickly. We’re monitoring it daily and it’s going well,” Rishabh shared. The Singapore Management University (SMU) graduate reported a “huge increase” in new signups but attributed it to WhyQ’s own marketing efforts and their Chinese New Year bak kwa deliveries. WhyQ officially launched in 2017, serving mainly the CBD area and delivering from over seven hawker centres. It started delivering islandwide for lunch and dinner every day since mid-2018. Rishabh also announced the upcoming rollout in February 2019 of two new features on WhyQ – a subscription service and a corporate catering portal – which he expects “[a] majority of growth coming from” these services. The subscription service will let customers get food delivered for as low as $4 a meal and they can choose from economy- to premium-tiered hawker meals and plan their meals for the next one month. For the corporate catering portal, organisations can place orders for events like seminars and workshops easily, and enjoy bulk order discounts.